Are y’all ready for an incredible before and after? We dug up some photos of #clientbeachroadnorth before we got our hands on her and we’re so excited to share these images. 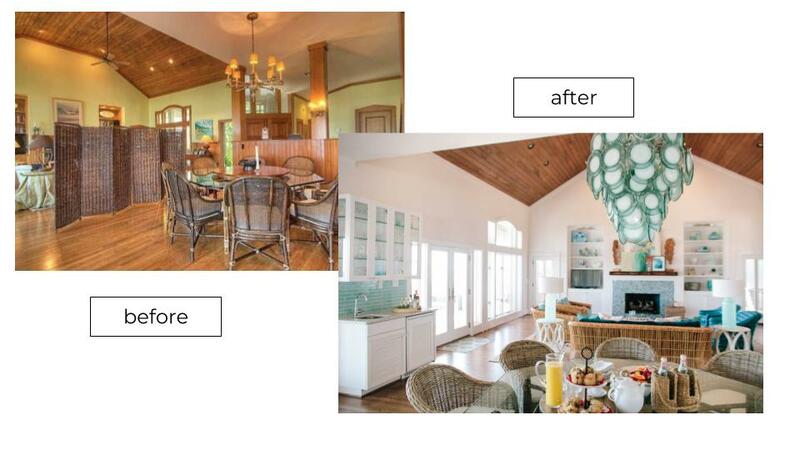 The beachfront home, located on Figure 8 Island, boasts incredible views but needed a fresh spin on its dark, outdated coastal look. 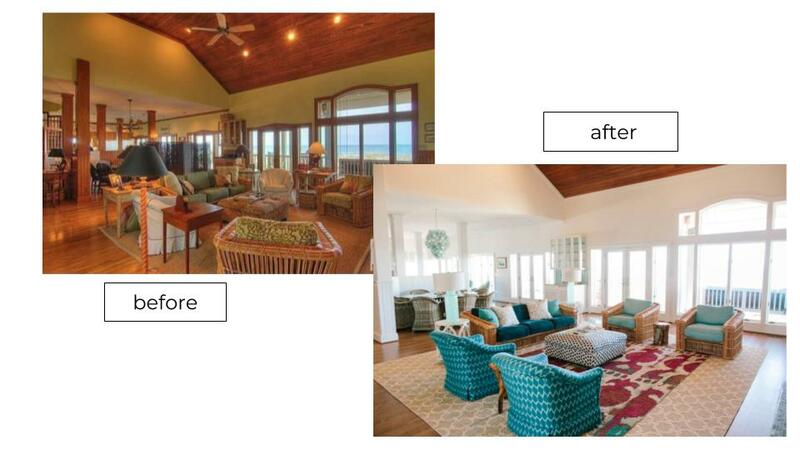 In the main living area, we kept much of the existing furniture but reupholstered it in updated, colorful fabrics. In an effort to lighten the space, we painted the entire space (except the vaulted ceiling) white. The fireplace needed some work, so we added a live edge mantel and fresh tile fireplace surround. 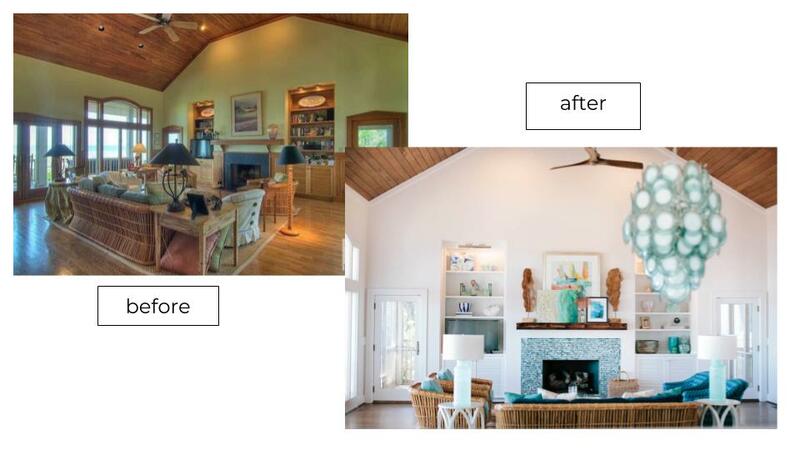 We placed new lamps, ceiling fan and accessories throughout. The kitchen packs a punch with the wow factor even though we kept the same layout, cabinetry and appliances. Before, the kitchen felt like a time machine straight back into the 1970’s. The mustard countertops and dark wood cabinets were functional but unattractive. 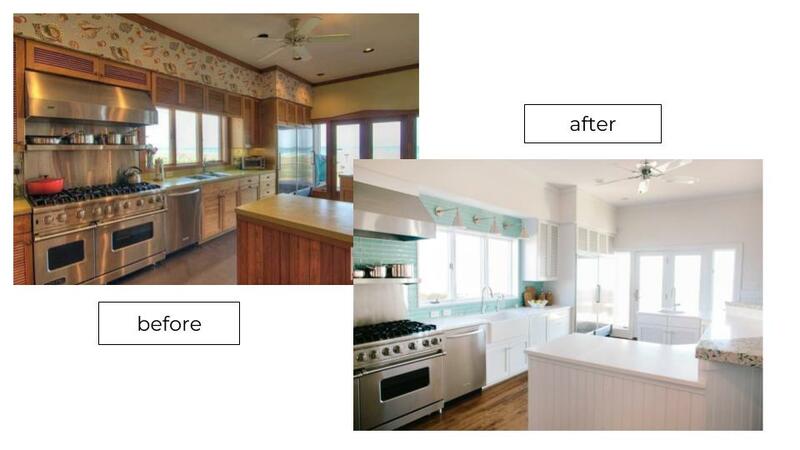 We slapped fresh white paint and new hardware on all the cabinetry and added a vibrant blue tile backsplash. Another fun feature of the new kitchen is the Vetrazzo countertops, created from recycled glass and oyster shells. We decided to keep the existing bar-stools but we recovered the seats in a coordinating blue vinyl. Because our clients have young grandchildren, the vinyl is a super practical choice and easily wiped off. We swapped out the breakfast/game table and chairs for a lighter, more modern combination. This gorgeous new light fixture sets the tone for the rest of the space. 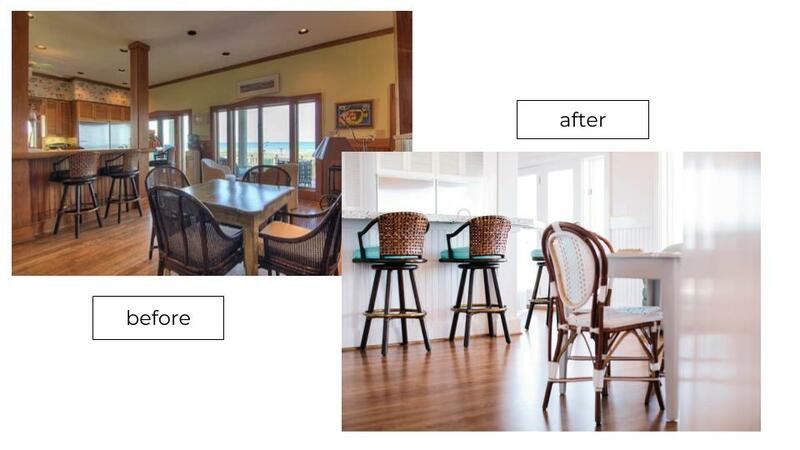 The existing glass top table worked well but we opted for new wicker dining chairs. 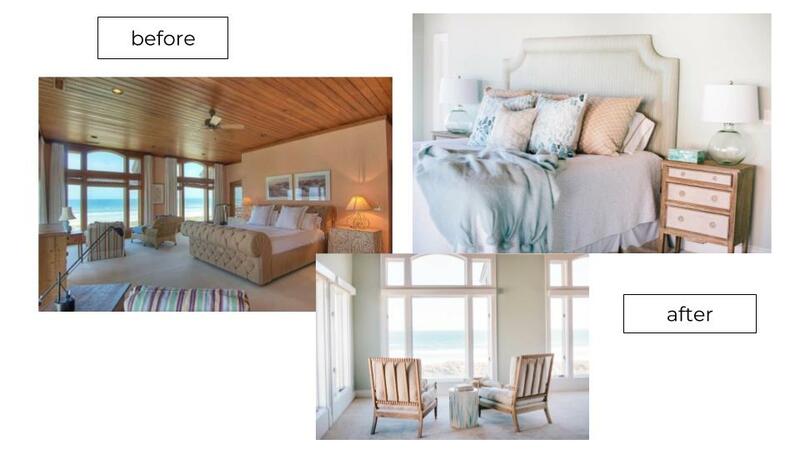 This massive master suite has gorgeous ocean views but needed a more serene color palette and new furniture. We swapped out the dated tufted bed with a more streamlined upholstered one, as well as pretty new side tables and lamps. The existing seating area was a great spot for morning coffee so we just traded out the pair of chairs for a more modern pair. 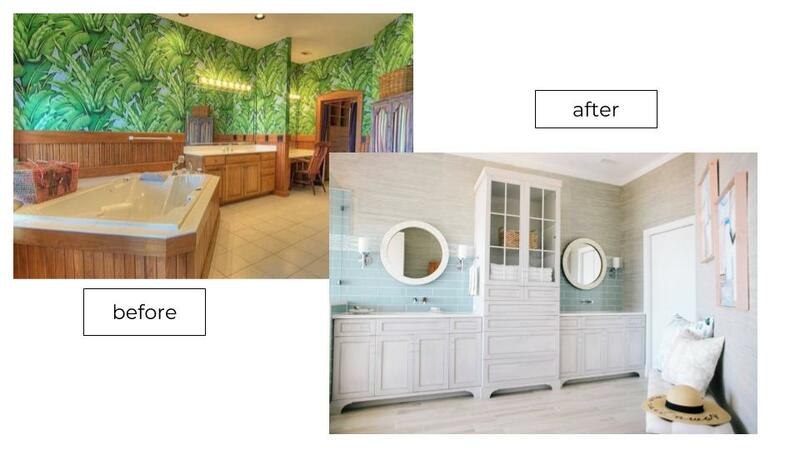 The master bathroom was one of the spaces that needed the most help. 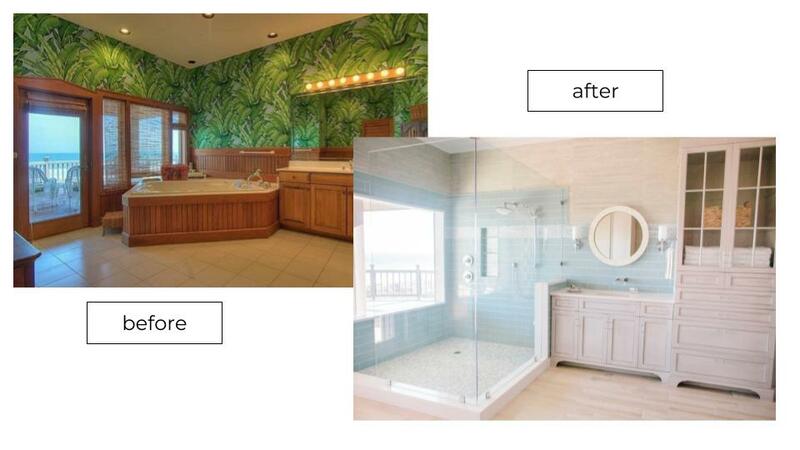 With “in your face” tropical wallpaper, a giant soaking tub and ugly wood cabinetry and trim, we were aiming to create a peaceful, spa-like setting for these clients. We made much better use of the awkward space and added a double vanity and loads more storage. 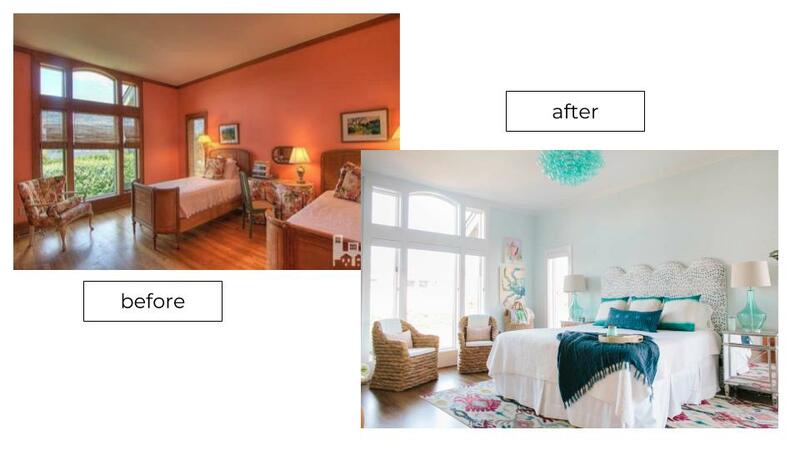 We lightened up this guest bedroom with pale blue walls and white trim. The funky glass light fixture adds a ton of character and interest to the space. We also added an upholstered headboard for the new queen bed in one of our favorite and most versatile fabrics, Brunschwig & Fils Les Touches. This bedroom originally had two twin daybeds and served as overflow sleeping quarters, but in reality, it was just kind of an unused space. 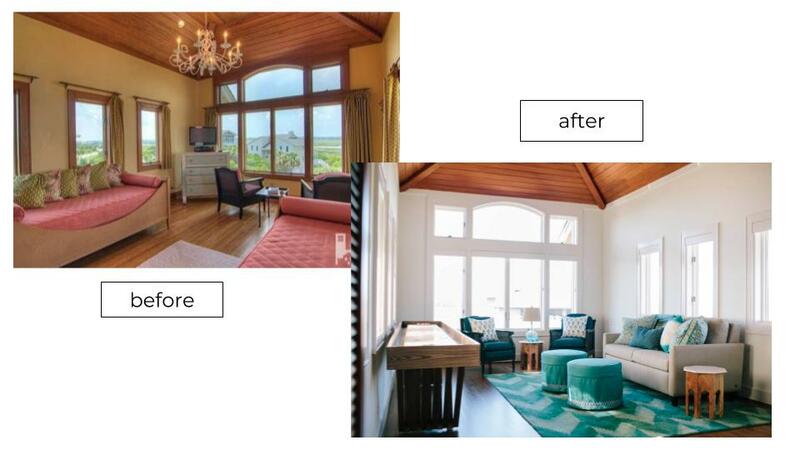 We worked with our clients to create a fun and versatile space. It is a game room and lounge and in one corner, there’s a wet bar. Now it has become one of the best hang-out spots in the whole house!